"De Foe is our only famous politician and man of letters, who represented, in its inflexible constancy, sturdy resolution, unwearied perseverance, and obstinate contempt of danger and tyranny, the great middle-class English character. "One of these authors (the fellow who was pilloried, I have forgot his name) is indeed so grave, sententious, dogmatical a rogue, that there is no enduring him." —Jonathan Swift. "He that will help you, must be hated and neglected by you, must be mobbed and plundered for you, must starve and hang for you, and must yet help you. And thus do I." 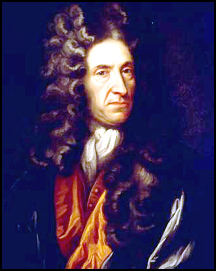 —Daniel Defoe. one who could say: "In the school of affliction I have learned more philosophy than at the academy, and more divinity than from the pulpit,—I have seen the rough side of the world as well as the smooth." 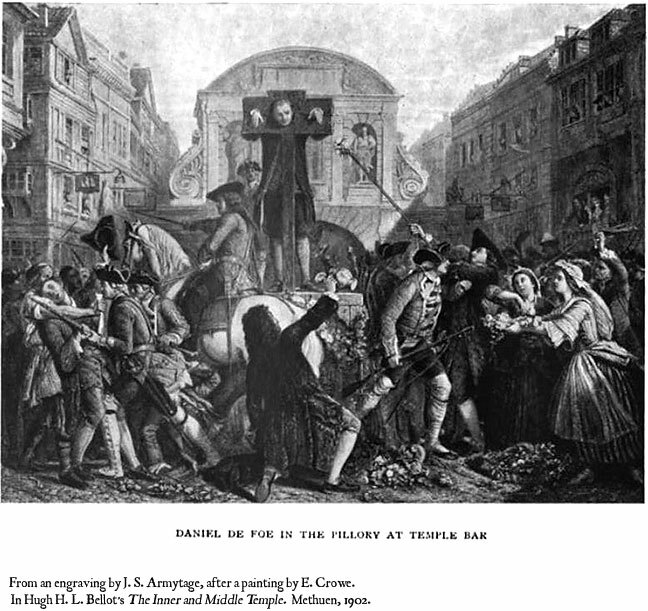 Daniel Foe, or Defoe, as he afterwards called himself, was born in or about 1659, in the parish of St. Giles, Cripplegate, London. Socially, his position differed from that of his greatest contemporaries in literature. By inheritance and conviction he was a Dissenter in religion; by occupation he belonged to the trading, or merchant class. His father, James Foe, was a butcher, and appears to have been well-to-do and respected; but we must remember that England had not yet learned the hard lesson of religious toleration, and that Defoe belonged by birth to a persecuted minority. The controversy waged over questions of religion was one of the disturbing political issues of the time; and, in Defoe's childhood, while Roman Catholics were feared and hated, Dissenters, who refused to conform to the services of the Church of England, were oppressed and despised. Defoe, born a member of this dissenting middle-class in such and age, was by that very fact forced into a life of struggle and controversy if he remained true to his standard. James Foe wished his son to enter the ministry, but the boy's tastes lay in other directions. When he was about eighteen, he left school, and, after some years of preparations, set up for himself in the hosiery business. We need not attempt to follow his changing fortunes during these early years. He took a keen interest in politics and in social and public questions, and held decided views; he is supposed to have taken part in the rebellion of the unfortunate Duke of Monmouth; and he became known as an effective pamphleteer. He cannot be called a poet, in any strict, or high sense; but he showed himself master of verse of a certain order, plain, vigorous, sensible and convincing. On the accession of William and Mary (1689), he became a strenuous supporter of the government. A few years later he failed in business, perhaps because his energies had been so largely given to literary and political pursuits; and after a time he became connected with a brick and tile manufactory at Tilbury, a little town on the Thames below London. This has been called "the most prosperous and honourable period of his life." He was honestly in accord with the Government, and an enthusiastic admirer of the King, to whom he had become personally known. He did the King good service by a pamphlet in defence of a standing army (1697), and by some vigorous verses, The True-born Englishman, which greatly increased his reputation1 The occasion of this vigorous production was the growing unpopularity of the King, and the violent attackes which had been made upon him and his Dutch followers because of their foreign birth. Defoe confronted the storm of popular feeling with a splendid audacity, and belaboured the whole English nation with no light hand. He pointed out that those who proudly claimed superiority on the ground that they were "true-born" Englishmen were themselves of mixed descent. There was no "true-born" Englishman, for the whole English nation, as then constituted, was the result of a mixture of various foreign elements. In speech an irony, in fact a fiction." Defoe's brief interval of prosperity was suddenly brought to an end by the King's death in 1702. Under the new sovereign, the High-Church party was uppermost; there was much violent talk against the Dissenters, and their position in the state became one of the questions of the hour. Defoe's contribution to the matter was an anonymous pamphlet, The Shortest Way with Dissenters (1702), in which, instead of arguing against intolerance, he affected to take the side of his opponents, and tried, by stating their position in the extremest and most brutal fashion, to arouse feeling against them. The result was almost farcical, for Defoe had assumed the tone of the extremists so cleverly that both sides took the tract literally. The Dissenters were furious, and some Churchmen delighted; but, when the real nature of the pamphlet became apparent, both sides, angry at being deceived, turned on Defoe. He had pleased nobody, and, as he says, the whole "world flew at him like a dog with a broom at his tail." 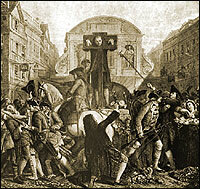 He was condemned by the authorities to stand in the pillory at Temple Bar, and imprisoned for nearly two years in Newgate. 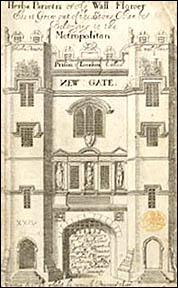 After Defoe was released from prison in 1704, his course became less open and straightforward. He was employed on sundry secret missions by the government, sometimes, he tells us, "running as much risk as a grenadier on a counterscarp." The dependence of the author upon the politician, which has been always referred to, had its temptations and its drawbacks as well as its advantages. It was a time of political uncertainty and of rapid change. Now the Whigs were in power, now the Tories; and the struggling author whose very livelihood was largely dependent upon the favour of the party in power had strong, if selfish, reasons for transferring his services to the winning side. Defoe had shown that he could be bold in the defence of an unpopular cause; but he was a master of the art of deception, and his character seems to have been a singular mixture of courage and duplicity. When the Whigs were in control, he served the Whigs, and when the Tories took their place, the Tories; and in doing this he stooped in one instance to a deception which it is certainly hard to defence. Yet it would be a great mistake to think of him as habitually willing to sacrifice his principles to his personal advantage; nothing could be farther from the truth. Addison called him a "false, shuffling, prevaricating rascal;" but, under all his tricks and disguises, there was a basis of conscience and of stubborn integrity. His position was often equivocal, his actions ambiguous; but on the whole he worked consistently for the promotion of civil and religious liberty, the cause in which he believed; he changed his party, but he remained essentially loyal to his principles; and, while he did not scruple to employ falsehood, he used it in the service of what he honestly believed to be the truth. One can sail under false colours in order to deceive the enemy without being a traitor to one's country, and it is probable that Defoe looked upon double dealing as a legitimate part of the game of politics. Such was the general character of the first sixty years of Defoe's life, years of change, struggle, and almost incredible toil. Up to this time he had made no great and permanent contribution to his country's literature. He had written much, and he had profoundly influenced the men of his own time; but a great part of his writings had been devoted to questions of the hour, and intended only to serve some present need. All his toil seemed to have brought him but little. Many regarded him with suspicion or contempt; he was a hanger-on of politicians, excluded from the select coterie of great writers, and a mark for the shafts of Addison and Swift; yet, at sixty, this journalist and political agent of questionable character published Robinson Crusoe (1719), a story which promises to delight the world so long ans the spirit of manly adventure and the love of the marvellous survive in the heart of man. It may seem strange to us that such a man should be able to turn aside at sixty from the tangles and turmoils of political disputes, and, by sheer force of imagination, to put himself in the place of a poor sailor, cast away on a solitary island in the Caribbean Sea; but, in reality, some of Defoe's past work had, all unknown to him, been a preparation for his great task. Even in his Shortest Way with Dissenters, he had shown his ability to assume, for the time, another man's point of view; and in his work as a purveyor of news he had cultivated that power which he naturally possessed in so large a measure,—the power of making fiction look like truth. He had the instinct of the journalist rather than the spirit of the old-time scholar; the quick perception of what was likely to interest and amuse his readers, and an adroitness which enabled him to turn any passing sensation to good account. He was expert in making a "good story," as a modern newspaper reporter would call it, out of an especially destructive storm, an earthquake, or the dying confession of a famous criminal; and in these stories truth and invention were sometimes so cunningly mingled that they became inseparable. Now, Robinson Crusoe is but a reporter's "story" in a more expanded and a more purely imaginative form. It has a basis of fact, for it was founded on the adventures of Alexander Selkirk, an English sailor, who, in 1704, was abandoned by his companions on the island of Juan Fernandes. After about four years of silitary exile, Selkirk was rescued, and on his return to England became an object of public interest. Steele wrote of his singular adventures in The Englishman; and Defoe — who is said to have visited him at Bristol — found in them the suggestion for a narrative which has made the imaginary Crusoe seem real and substantial, while Selkirk, the actual man, is but little more than a name. But while we can in part explain how it came to be written, the production of such a book as Robinson Crusoe remains one of the marvels of literature. Out of the fret and partisanship of an artificial time, when Pope and the rest are treating of the fashions and follies of the town, there comes suddenly the story of a far-away world; the story of a man in an almost primitive relation to nature, shut away from kings, or party squabbles, or political institutions, and set face to face with the first vital problem of the race, the problem of wresting food and clothing and shelter from the earth and the sea by the ingenuity of his mind and the labour of his hands. The success of Robinson Crusoe diverted Defoe's energies into a new channel, and he wrote a number of other stories which make his later years the most brilliant literary period of his life. Among these "secondary novels," as Lamb called them, The Memories of a Cavalier, The Life of Captain Singleton, Moll Flanders and The History of Colonel Jack, are perhaps the best known. As a whole, none of these stories is equal to their great forerunner; yet they are full of marvellous bits of descriptive writing, and contain single scenes of great dramatic and narrative power. With Robinson Crusoe, these stories laid the foundations of English realistic fiction. Among these works of Defoe's last years, The Journal of the Plague Year (1722) holds a place by itself. It is probably the most wonderful example of Defoe's power of mingling fact and invention, and of imparting to the whole the appearance of simple truth. It is a minute, and apparently exact and careful account of the Great Plague which desolated London in 1665; and it professes to be the Journal of an eye-witness, a saddler, who remained in the city during the pestilence. It is not a story as we commonly understand the word, for it can hardly be said to have a plot; it is, to all appearance, but the simple, ghastly record of death, and terror, and sorrow, set down by an ordinary citizen who has lived through the experiences he describes. There is no display of emotion; nothing but hard, awful fact. We do not think of it as a work of art; it is nature, our daily commonplace life in its hours of tragic crisis, in those unexpected dramatic situations which seem beyond the fancies of the romancer. We hardly realise at first that Defoe's imagination has created this, and that to produce such a perfect illusion remains the finest and most finished art. Defoe lacked many qualities which other great masters of fiction possessed; but, when he is within his own province, as in this Journal of the Plague, he has been seldom approached and perhaps never surpassed. When he published Robinson Crusoe, Defoe was in easy circumstances; but towards the close of his life he became again involved in difficulties, and even his stron and brave spirit was at last shaken by repeated misfortunes. Beset by poverty and troubles, he writes the year before his death: "I am so near my journey's end, and am hastening to the place where the weary are at rest; be it that the passage is rough and the day stormy, by what way soever He please to bring me to the end of it, I desire to finish life with this temper of soul in all cases — Te Deum Laudamus." His magnificent vitality which had brought him through so much now at last broke, and he "died of a lethargy" in a London lodging-house in 1731. He was buried in a famous Non-conformist cemetery in Bunhill Fields, London; here John Bunyan and Isaac Watts lie also, and his grave is now marked by a monument erected to the author of Robinson Crusoe by the children of many lands. 1 According to Defoe's estimate, eighty thousand copies of this poem were sold in the streets. 2 "This [the Review] was his largest, if not his most important, work, embracing in over five thousand pages essays on almost every branch of human knowledge; during the same nine years he published eighty distinct works, with 4,727 pages." Chambers's Cyclopedia of English Literature (new editions), vol. ii, p.150. Pancoast, Henry S. "Daniel Defoe." An Introduction to English Literature. 3rd ed. New York: Henry Holt and Company, 1907. 363-371. Created by Anniina Jokinen on October 5, 2006. Last update May 6, 2007.